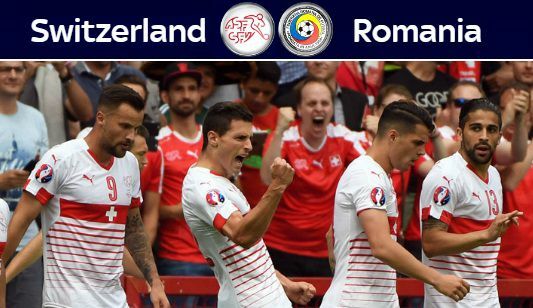 Having lost in the opening fixture, Romania needed to win against Switzerland but not many people gave them a chance against highly rated Swiss side. But credit to Romania who came out stronger and took the lead early in first half when Bogdan Stancu scores his second penalty of the tournament after referee gave a penalty for Stephan Lichtsteiner pulling romania player’s shirt. Switzerland however looked better after the conceded and they will go all out for a equalizer after the break. 18′ 1 – 0 Bogdan Stancu scores second penalty of the tournament as he sent Switzerland keeper the wrong way. Switzerland can qualify for the european championship knockout stages for the very first time and become first team in this year tournament to book their place in next round. Although they will have to tackle a very difficult side Romania who gave France a right scare in the opening fixture. Switzerland won their opening match against Albania but after a good start in the game they failed to break down Albania who were playing with 10 men for most part. Historically this fixture has been very competition and both sides have won 5 each in the 13 meetings between the two. Romania will have to comeout and take the game to Switzerland who might be happy with a draw which will put them in great position to qualify for next round. Switzerland are expected to name an unchanged side for tonights game and keep the momentum built from their win over Albania. Romania might make a few changes in the starting lineup, specially the 35 year old right back Razvan Rat who struggled for pace and we might see young player Steliano Filip given a chance to play in full back position.